Shaken or stirred? Gin or vodka? Equal parts or not? There are probably as many martini recipes as there are bartenders (and secret agents). One thing is certain though – Martini’s are not for the faint-hearted. Don’t overdo it with this one, or you might never have the desire to have Martini again. Below are the most classic and popular martini recipes we could lay our hands on. 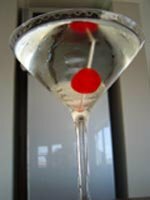 Martini’s are easy and straight-forward to make and so a great choice if you are low on stock or in a hurry. An all time favourite pre-dinner drink. Martini’s are commonly made with gin. Sometimes with vodka, like 007 prefers his martini. But you can pretty much mix anything into your martini. BARTENDING TIP: Shaking gin gives it a cloudy texture. When mixing gin with other clear ingredient, rather stir than shake it if you want to keep the mixture clear. Visit our Cocktail Mixing Guide for an explanation of the terms used on this page. This recipe comes from Ian Fleming’s book Casino Royale (1953). Preparation:Shake (not stir!) the ingredients well and strain into the glass. To read more about this cocktail on Wikipedia, click here . The classic! Often drank before dinner. Preparation:Stir the ingredients well and strain into the glass. Hands down the most popular martini ever. At Cocktail Mixing Master we feel this one is a bit without personality. Try a few varieties: add a few drops of triple sec, or increase the portion gin. See our Gin Cocktail Recipe Guide for cocktail called the Bronx, which is another nice variation of the dry martini. Preparation:Muddle the lemon and jalpeno. Pour this and the other ingdredients in a shaker, shake well and strain into the glass. Also referred to as a “vodkatini”. This is a Dry Martini with vodka instead of Gin. Garnish:Green olive on a cocktail stick. Alternatively, squeeze in a bit of oil from a lemon peel. As far as classic martinis go, this is a Cocktail Mixing Master favourite. Preparation: Shake the ingredients and pour into a martini glass. Garnish: Slice of lime or a seeded fresh lychee. There are many, less brutal, variation on the martini’s above. For example, add a dash of soda water or fruit juice, or drink your martini with ice. *Cocktails marked with a * are official cocktails of the International Bartenders Association (IBA). In some cases the recipes here do not correspond exactly with that of the IBA.